The term folklore generally refers to traditional beliefs, myths, legends, and tall tales. Folklore from North America has a long and proud history. Native American folk tales and myths are as numerous and diverse as they many tribes they originate from. Often they explain natural phenomena or the relationship between people and the spirit world. When it comes to American folk tales, many are the stories of how the country developed and of the different cultures that have come to call it home. Check out the following titles and remember that more information and other titles can be located easily at www.clcd.com. In a marvelous blend of folklore, historical fiction, and biography, the author tells the story of Amadito and his family, who must contend with the perils of the 1918 Spanish Influenza pandemic. As the flu makes its way into small New Mexican communities, residents make use of quarantines, prayers, ritual purifications, and food remedies in an effort to stay safe. In spite of such efforts, many die. The incident offers a sobering but realistic backdrop for the author to also introduce readers to the smallpox crisis of more than a century earlier and the practice of variolation, or using blisters from victims to inoculate those around them. Although the book resembles a picture book physically and includes some attractive and colorful illustrations, the text is much more advanced. An afterword by Michael León Trujillo offers an analysis of the story and provides additional information about the viruses described and the treatment methods for each. While this book would provide a good story for older children, it would also make a useful supplementary text for high school and beginning college classes. 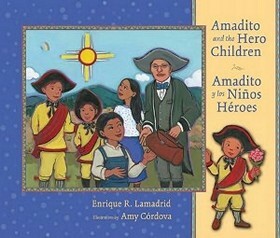 2011, University of New Mexico Press, Ages 9 up, $19.95. Reviewer: Ramirose Attebury (Children’s Literature). Zardi (short for Scheherazade) is just about to turn thirteen when the sultan of Arabithia kidnaps her older sister, Zubedaya, as punishment for her father’s treason, threatening to kill the girl in ninety days and to return to do the same for Zardi. 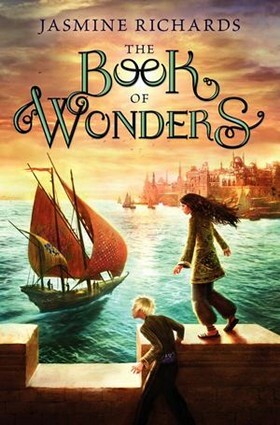 Disguising herself as a boy and joined by her best friend, Rhidan, Zardi finds her way onto the ship of Sinbad with the intention of finding a magical item that will allow her to save her sister and possibly oust the sultan for good. The journey is fraught with danger, and the days fly by as Zardi and her fellow pirates battle storms, end up on snake-infested desert islands, clash with mechanical giants, and outwit tricky djinn only to discover that their tale doesn’t end with Zubedaya’s salvation. The Middle Eastern overtones here make this a refreshing addition to the mostly European-oriented genre of middle-grade fantasy, and Richards borrows heavily from the Arabian Nights and various Arabic folktales to offer up a strikingly vivid setting populated with awe-inspiring creatures. Once Zardi joins up with Sinbad, the adventure comes fast and furious, and although the characters are mostly two-dimensional, the action-packed plot makes up for any blandness amidst the sea-faring crew. Whether readers are familiar with original Scheherazade or not, the quick pace and high-seas adventure make this widely appealing and may in fact send some readers to the 398s to check out what else her tales have to offer. 2012, Harper/HarperCollins, Grades 5 to 8, $16.99 and $9.99. Reviewer: Kate Quealy-Gainer (The Bulletin of the Center for Children’s Books, February 2012 (Vol. 65, No. 6)). “This is the pot that The farm maiden stirred”, begins Samantha R. Vamos’s playful representation of a recipe for arroz con leche–rice pudding. Following the basic structure of “This Is the House That Jack Built,” ingredients, utensils, and participants are added to demonstrate the process, which becomes more complex as the pudding cooks. 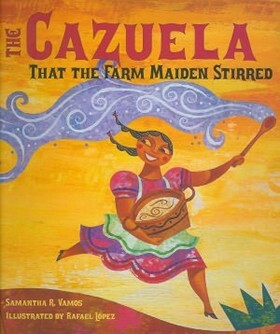 To add to the fun, each turn of the page repeats the previous phrases, but with key words first introduced in English now in Spanish: The pot becomes the cazuela, the cow becomes thevaca, and the sugar becomes the azucar. By the end of the sequence, when the cazuela is finally ready, everyone involved in its creation says thanks and celebrates the dish they all worked hard to make. Patterned language, rhythm, and repetition, coupled with illustrator Rafael López’s brilliantly hued acrylic paintings, capture the excitement of this lively story. A recipe for arroz con leche and glossary with a pronunciation guide for Spanish words are also included. 2011, Charlesbridge, Ages 4 to 8, $17.95. Reviewer: CCBC (Cooperative Children’s Book Center Choices, 2012). 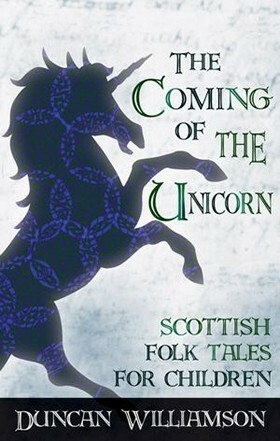 This engaging collection of Scottish folktales opens with a splendid bit of scene-setting in the introduction, in which the niece of noted Scot storyteller Williamson tells of her experiences as a “wee one” sitting around the campfire listening to the “cracks and tales” told by her uncle and his fellow Travellers (Scotland’s version of Gypsies): “There was no such thing as the ‘children’s place’-everybody’s place was round the campfire.” Following this inviting opening is an assortment of eighteen traditional stories that run the gamut of familiar thematic elements, from the virtues of humility in “The Tramp and the Boots,” to the triumph of cleverness over power in “Jack Goes Back to School,” to the benevolent beauty of nature in “The Broonie of Cara.” The conversational style, replete with colloquialisms and slang (helpfully defined in the glossary in the back), not only draws the reader in with its direct addresses and playful winks but also serves to pay a powerful tribute to the oral tradition that gave rise to these stories. Most of the tales, therefore, are far better suited to be read aloud than alone-just make sure you’ve got plenty of kindling to keep the fire going. 2012, Floris, Ages 8 to 12, $15.95. Reviewer: Kate Quealy-Gainer (The Bulletin of the Center for Children’s Books, September 2012 (Vol. 66, No. 1)). 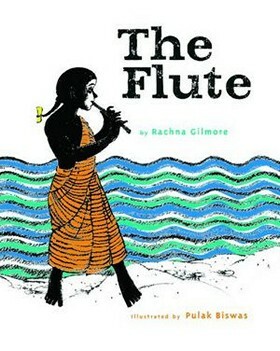 The Flute is an Indian folk tale about an orphan girl named Chandra who nearly drowns in a raging river. Her loving parents save her by placing her high in the branches of a tree. Later she is given to her cruel aunt and uncle to raise after her parents had drowned in the river. Chandra comforts herself with playing on a wooden flute, songs like her loving mother used to play. However, her uncle threw the flute, belonging to her mother, in the river. Chandra has to care for the cows and she is fed less and less when the rainy season does not come and the food sources shriveled. However Chandra discovers a place far up the river, wandering with her cows, where she hears her mother’s flute music and magically receives food from the air such as her mother used to cook for her. Finally Chandra follows the swollen river as the monsoon returns and her uncle and aunt desert her to the river, calling her an evil child and blaming her for their misfortune. In the depths of the river Chandra finds the magic flute again and allows it to conduct her to safety in the form of a rope. As she plays her hope and enduring strength on the flute, a new couple hear her playing and offer to adopt her in place of a son they had lost to the river. Chandra agrees and leads a happy life, working and playing her flute by the rushing river. “The Flute” is ornamented and further interpreted with stunning black and white paintings with vivid splashes of red for Chandra’s dress, blue for the river, and yellow for the overlooking moon. This author/illustrator team is first class and deserves further high awards for artistry, authenticity and design. 2012, Tradewind Books, Ages 3 to 7, $16.95. Reviewer: Midwest Book Review (Children’s Bookwatch, February 2012). Gentlemen Send Phantoms by Laini Taylor starts the “fateful” collection off beautifully with a folklore-ish take on a single girl’s timeless question of “who will I marry?” Thirteen Young Adult (YA) authors follow suit with their prophetic tales ranging in topic from religious zealots, in Diana Peterfreund’s Burned Bright, angry bones in Lisa McMann’s The Angriest Man and the power behind negative thinking in Matt de la Peña’s The Mind is a Powerful Thing. Each story rises to the occasion whether it is about a carnival fortune teller in Kami Garcia’s Improbable Futures, a badly burned Princess that must find the cure for her stepsister’s ailment in Saundra Mitchell’s The Chosen One, or a fateful day that will end the lives of the immortals, in Margaret Stohl’s Death for the Deathless. 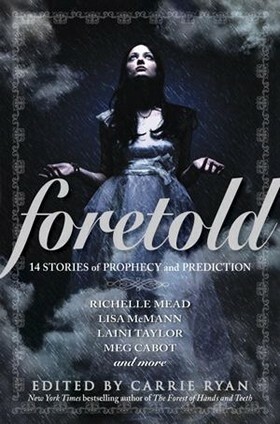 The stories are each page turners and fit together perfectly in this anthology. One True Love by Malinda Lo delivers a twist on soulmates, while Michael Grant tells of the power behind a teacher/student relationship in This is a Mortal Wound. One of my favorite stories is The Killing Garden by Carrie Ryan, where a daughter follows in her father’s footsteps as gardener to the Emperor as she trims down the “weeds” that overtake the land and yes, by gardener I mean assassin. Richelle Mead shares her well beloved dhampir characters Dimitri and Rose from her “Vampire Academy” series and their battle with a Russian Strigoi in Homecoming. Rounding out the mix is Simone Elkeles’ Fate, a tale of RV park romance, Meg Cabot’s Out of the Blue alien abduction story and Heather Brewer’s Misery about growing up in a town of black and white proportions. I would highly recommend this book to readers that enjoy YA novels about tempting the fates. One never knows what their future might bring. 2012, Delacorte Press/Random House, Ages 12 up, $18.99. Reviewer: Toni Jourdan (Children’s Literature). The story begins with a sparrow entreating a kindly baker to remove a thorn from his foot. The cunningly selfish bird then tricks his rescuer into giving him some bread. From there, he establishes a pattern of duplicity whereby his spoils escalate in value, with a sheep and bride ultimately among the casualties. 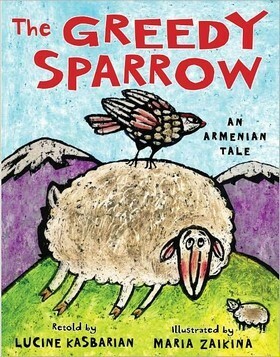 This classic Armenian fable (Crime never pays! is the lesson at the end) is retold to the accompaniment of richly chromatic, folkloric scenes by a Moscow native that bring to mind Ukranian Easter eggs. Ages four to eight. Reviewer: Julie Eakin (Foreword Magazine, March/April 2011). Times are tough in young Shaina’s town. 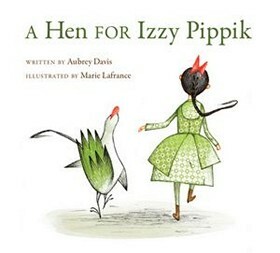 When a magnificent-looking hen pecks her toe, she traces it back to a broken crate labeled “Izzy Pippik: Chickens and Eggs.” Her hungry family eyes the chicken, but Shaina insists it belongs to Izzy Pippik and they must keep it until he returns. So they also can’t eat the eggs the hen lays, because they don’t belong to them either. And Shaina steadfastly insists that everyone must wait for Izzy Pippik to return, as more and more eggs hatch into chickens. Soon curious visitors bring prosperity to the village. Izzy Pippik’s return makes for a surprise happy ending. Lafrance creates the small town with food stalls and streets crowded with people in appropriate clothing, all set to deal with the increasing number of chickens. Double-page scenes depict Shaina’s efforts to convince the townsfolk of the right thing to do. Photoshop brings color to the crisp pencil drawings, creating an atmosphere of innocent joy in this ancient folk tale. The final illustration of Shaina and her hen exudes the emotional positive success of her efforts. 2012, Kids Can Press, Ages 4 to 8, $16.95. Reviewer: Ken Marantz and Sylvia Marantz (Children’s Literature). When Dad comes home one day with a lion that he insists is a dog, Mum says the family should just go along with it. 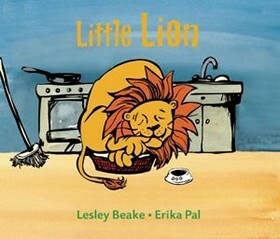 Our young narrator and his brother find it hard to sleep when the lion roars, but Dad says it’s just snoring. After a while, they all get used to having the lion around. But the boys try to keep the unusual pet a secret. Unfortunately Big Jonno, the local bully, finds out and teases them. One day the lion gets out of the house. Searching for it, the boys discover it on top of a terrified Jonno. They wait a bit before calling it off, enjoying their triumph. “Then we took our dog home.” They smile as they figure Jonno will not bother them again. The jacket illustration of a smiling lion and a dish labeled “DOG,” suggest the dilemma inside. The many pictures of the objects related to a dog’s life add to the mix-up. The ink and watercolor scenes are naturalistic but rendered with comic intent. 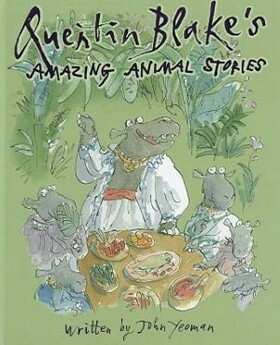 The story is based on a South African folk tale, but the illustrations suggest a contemporary suburban South African community with kids in school uniforms. The most fun comes as the growing lion tries to play the role of family dog. The front end pages are filled with doggy items, while on the back pages, the lion gazes fondly at a lamppost on a moonlit night. A note discusses the original folk tale. 2012 (orig. 2011), Frances Lincoln Children’s Books, Ages 4 to 8, $17.99. Reviewers: Ken Marantz and Sylvia Marantz (Children’s Literature). Megan’s Year: An Irish Traveler’s Story is a volume in the “Tales of the World” Series from Sleeping Bear Press, which partners with another series titled Discover the World to make fictional stories from exotic lands available to young readers. 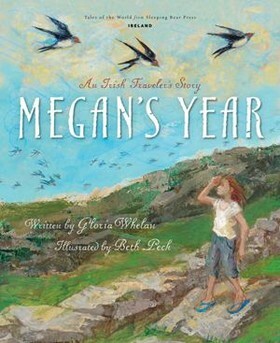 “Megan’s Year” is about a girl in a family of Irish Travelers, whose parents migrate through parts of Ireland, seeking seasonal and other work during the summer months. There is a Summer Megan and a Winter Megan. The Summer Megan travels in the caravan with her family moving from job to job and living off the land with other Travelers. The Winter Megan returns to government housing in apartments in Dublin, and attends St. John’s National School. Sometimes other girls are unkind to Megan at school, calling her a dirty tinker. The Sisters (teachers) try to teach all children to show charity. Megan misses her summer life in the winter school days. Megan’s family are descended from Irish farm folk who were forced off their land by English landlords and the potato famines. Today about 25 thousand Travelers, or Travellers, as they are called in Ireland and England, lead an itinerant life style seeking seasonal employment and moving about. They have their own culture and a unique secret language called Gammon. “Megan’s Year” introduces students to a different life style and some of the expressions of Gammon, while describing a year in the life of a young girl. “Megan’s Year” is both compassionate and honest in its representation of the life of the Irish Travelers today. “Megan’s Year” is highly recommended for students ages 6 to 10. 2011, Sleeping Bear Press, Ages 6 to 10, $16.95. Reviewer: Midwest Book Review (Children’s Bookwatch, December 2011). In this retelling of an ancient Middle Eastern folktale, a kind prince comes to the aid of a mouse caught in the thorns of a bush. The grateful mouse never forgets the prince’s compassion. 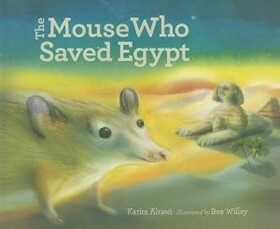 Years later, the prince becomes a pharaoh, and the mouse overhears a group of men planning a surprise attack. The mouse tells his colony that the “kind man” from his past needs help. Thousands of mice send the marauders fleeing by chewing through the leather of their clothing and weapons. In gratitude, the pharaoh builds a temple to the sun god and includes a statue of a golden mouse to remind the Egyptian people of the power of kindness. Bee Willey’s sun-drenched illustrations show ancient Egypt in all of its splendor. Hieroglyphics adorn the walls and pillars. The mouse appears on every page, and observant readers can follow the small creature’s journey. Everyday Egyptian life both for people and mice is depicted in split scenes. As the pharaoh ruled kindly, “the country prospered and the mice ate well.” Tables are laden with watermelons and bowls of sardines, and the mice enjoy seeds and rice. Karim Alrawi’s storytelling has the straightforward simplicity of an Aesop fable. The messages from the sun god Ra are lyrical written: “Every kind act is a seed sown./Aiding others with their troubles/Reaps help with one’s own.” Pair this tale with Jerry Pinkney’s The Lion and the Mouse for a discussion of how “True greatness is being kind.” 2011, Tradewind Books, Ages 5 to 8, $16.95. Reviewer: Linda Ludke (CM Magazine, January 6, 2012 (Vol. XVIII, No. 17)). 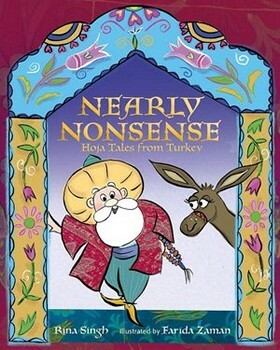 This excellent collection of Turkish Hoja tales captures the idiosyncrasies of this folk hero–judge and harried married man, religious leader, and occasional simpleton. His simple understanding can shake the pride out of the arrogant scholar as in the last tale, while his desire to be thought wise can make him the laughing stock of the village market as in the first tale. Hoja’s ability to take advantage of the moment is delightfully shown in the tale of The Four Arrows where his poor shots are characterized as those of the soldier’s, the chief’s, and the general’s, but the bull’s eye belongs to Hoja alone. Beautifully illustrated on each page with just a whisper of comic book art and beautifully patterned Turkish tile friezes; Hoja’s exuberant smile flashes through the pages, encouraging the reader to laugh out loud at his varied predicaments. Even as young listeners are giggling, they may take note of some of the simple lessons and apply them to their own lives. 2011, Tundra Books, Ages 6 to 12, $17.95. Reviewer: Lisa Greenberg (Children’s Literature). Yeoman and Blake team up again and present a collection of fourteen amusing folk tales involving animals. Find out why the hippopotamus lives submerged in the water, how the turtle gets his shell, or why the coyote has poor vision. In some of the stories, discover how animals come up with a course of action to resolve a problem. For instance, an aging cat comes up with an idea to trap a mouse for its meal without having to chase it. Two clever mice become wise to the cat’s plan and devise a way to outsmart the cat. In the taleabout the alligator and the jackal, the jackal outwits the alligator who makes several attempts to make a meal of the jackal. In a different story, a ram saves his life by outsmarting both a leopard and a jackal. Some readers may recognize Blake’s style of drawing from some of Roald Dahl’s books like Charlie and the Chocolate Factory, The Twits, and Matilda. 2012, Pavilion Children’s Books/Anova Books Company Ltd, Ages 8 to 12, $19.99.. Reviewer: Carrie Hane Hung (Children’s Literature). Raven is a glutton. She wants to eat and eat without ever working, and even tricks others to get their food. When she notices that the hard-working Snipes have gathered a full store of shellfish and berries for the winter, she invites herself to dinner knowing that the native rules of hospitality will insure an invitation to dinner. As the Snipes eat politely and share their food, Raven stuffs her beak and grabs more and more. Then a Snipe mentions that they always have a full supply of food because of his mother’s skill in magic. Raven begs to know Snipe magic and she is tricked by the clever Snipe into dancing in blazing fire, damaging her wings and tail, and then bashing herself in the leg with a sharp rock. Finally, when she can no longer withstand the pain she flies away, cawing loudly. Then, the Snipes go back to their happy life of working hard to store supplies for the winter so they can survive another year in the cold north islands around Vancouver. This delightful, moral tale of trickery and prudence is told in a calm storyteller’s voice and illustrated with black-and-white sketches in which the physical features of the two bird species can be clearly seen. This book is an excellent addition to the classroom library or a collection of Native American tales and lore and is a vivid read-aloud for younger children. 2003 (orig. 1991), Harbour Publishing, Ages 7 up, $7.95. Reviewer: Elisabeth Greenberg (Children’s Literature). 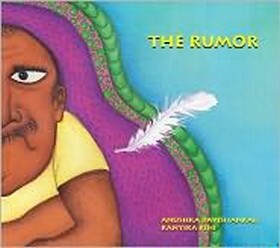 The Rumor is a delightful Indian children’s tale that seems closely related to a game once known as “telephone.” A remote village called Braddbaddpur has provided a setting where people like to tell tales ‘so tall that if you put them one on top of the other, they would reach the stars.’ Grim, dour, unpopular Pandurang (whose face can sour milk) is surprised one day when he coughs up a feather. From that strange experience and its retellings by curious villagers grows a vast and hilarious mythic tale. Brilliant, bright and funny illustrations picture every fantastic embroidery, and the final result ultimately become simply too large to support. Children will love the easy familiarity and cozy village style of this Indian version of a game of ‘telephone.’ All the Indian names are quite beautiful and fun to learn to say together, adding to the exotic aura of The Rumor. In the end, everyone learns a little more about the progress of rumors. Humor is a great solvent, and perhaps the best teacher. 2012, Tundra Books, Ages 4 up, $17.95. Reviewer: Midwest Book Review (Children’s Bookwatch, July 2012). This book belies its name; it is not a trinket, but a treasure! 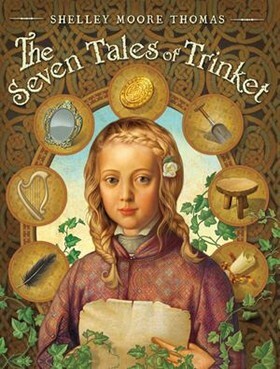 The Seven Tales of Trinket follows young Trinket and Pig Boy Thomas in a coming-of-age quest after her mother’s death. Trinket “never loved anything so well as a story” except her mother, of course, who died of grief after Trinket’s father, James the Bard, disappeared on a tale-telling trip and never returned. Armed with the Bard’s hand-drawn map and a few treasures such as Trinket’s mother’s mirror, the two children go in search of him. Through a series of adventures with the Gypsy King and his Seer daughter, selkies who have stolen a baby, a wee banshee who terrorizes a town, and a dancing contest between a faerie queen and a human girl, Trinket discovers and greets her calling, to be a teller of tales and creates seven tales out of her adventures. Thomas may be a lowly Pig Boy, but he also discovers his gifts: to be a companion, a protector, and perhaps a healer of animals. This book is also a model of storytelling, explaining the genre and the process. It even shows how two different endings for a story could be told-a nice tool that a storyteller might use for two different audiences or even just a special ending for the listener who has one more question or comment that could lead a story in a new direction. 2012, Farrar Straus Giroux/Macmillan, Ages 8 to 12, $16.99. Reviewer: Elisabeth Greenberg (Children’s Literature). In a land called Finnmark, a young girl, Halva, discovers a white bear cub she decides to adopt. The bear cub becomes her dear companion that helps out on a special Christmas Eve. While Halva’s parents remain cautious, “Sister Bear” impresses them. One winter, Halva decides to show off Sister Bear to the king of Denmark. On the way, they stop at a lonely house to spend the night. The owner says that the trolls come to the house at Christmas Eve and force him and his family to leave. Halva and Sister Bear decide to host the trolls. When the trolls arrive, the trolls, being very near-sighted, see a cat instead of the bear. Halva and Sister Bear tackle the trolls and leave a well-furnished home for the residents. Sister Bear impresses strongly on the trolls that she and Halva are not to be bothered. 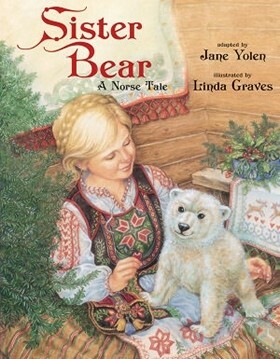 Jane Yolen takes a traditional Norwegian tale and places an engaging female duo in the starring role instead of the usual male. The softly-colored and detailed illustrations beautifully complement the story. Older and younger elementary students can enjoy the adventure. When the trolls appear, a nice bit of suspense comes with a rather diplomatic solution to removing the trolls. Yolen has adapted wonderfully a little-known tale from Norway; her note in the front of the book helps explain how this story originated. 2011, Marshall Cavendish, Ages 5 to 8, $17.99. Reviewers Elizabeth Fronk (Children’s Literature). American Indian culture is rich with myths that attempt to explain the world. This book, part of the “Short Tales Myths” series, tells the story of the twin heroes, Monster Slayer and Born for Water, who made the world safe for people by killing dangerous monsters that were roaming the earth. The tale has many features common to other folk tales: a mysterious birth, an unknown father, a search for identity, a benevolent mentor who grants special powers, and a test to prove courage. In the end, the twins are able to help mankind by defeating most of the monsters, but they allow five to live: Hunger, Poverty, Sleep, Lice, and Old Age. Their reasons for sparing these monsters serve to underscore their love and respect for humanity. Throughout the tale, links are made between the world of the twin heroes and the real world today: the bones of fallen monsters are the fossils that we still find in the western part of the United States, and the blood of the slain Big Giant is the lava that flows today. The text consists of a few sentences, artfully separated from the illustrations, on each page. The illustrations are colorful, and some of the facial expressions are quite striking. 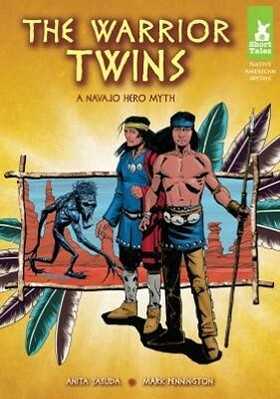 The book contains a page describing the characters and a short introduction to Navajo myths. Children who are interested in American Indian culture will find this book, and probably the whole series, interesting and instructive. All children, however, are likely to enjoy this story, since so many of the elements are familiar to them from the popular culture of superheroes. 2013, Magic Wagon/ABDO Group, Ages 3 to 8, $24.21. Reviewer: Leona Illig (Children’s Literature). Ti-Jean, the youngest son in this collection of three folk-based tales, is a character in the tradition of folk characters that don’t always make wise choices but somehow their choices always end well. Whether the character is called Jack, Noodlehead, or Ti-Jean, this genre is always good for a laugh, especially when it is as well-written as this group oftales. 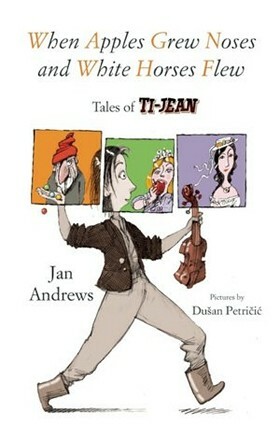 In Andrews’ collection, Ti-Jean has been transposed to Canada, although the sensibility remains European. Ti-Jean bests a know-it-all princess, a red-toqued marble player, and a landlord who ends up giving the foolish son half of his land and his daughter. The tales adhere to the “rules” of folk tales: magic happens in threes; good deeds are rewarded; and, of course, everything ends happily ever after. The characteristic that marks this collection as exceptional is the storyteller’s voice. The stories are told sequentially and logically, with just enough embroidery to engage the listener. The sequencing and humor make them ideal for storytellers (remember to give credit to the author!) to introduce new audiences to the joy and long tradition of sharing folk tales. The voice is also excellent for reading aloud with many places to pause and ask listeners, “And what do you think happens next?” Ti-Jean is not the same old Jack and the Beanstalk clone, and there is enough feminism (princesses do have some choice in who they will marry and when) to establish these stories as tales for a new era. A necessary purchase for good folk tale collections. 2011, Groundwood Books, Ages 7 to 11, $16.95. Reviewer: Lois Rubin Gross (Children’s Literature).